"Finding That Your Body Just Isn't The Same After Baby? Call Us Today To Learn About Our Mommy Makeovers!" "Because Certification Matters! Dr. Hollingsworth is the leading certified plastic, cosmetic and reconstructive surgeon in Texarkana!" Achieve the silhouette that you have always wanted or are wanting back. If you are finding that your "tummy pooch" will not go away no matter how much exercise, we can help! A face lift can improve some of the changes that come with age and give you a fresh and youthful look. Is your body just not the same after having your little one? We can fix that! Relieve the strain on your shoulders, neck, and back. Dr. Charles Hollingsworth is a Board Certified Plastic Surgeon who has been practicing in Texarkana since 1986. Dr. Hollingsworth specializes in cosmetic, plastic and reconstructive surgery. Dr. Hollingsworth is also a Board Certified ENT Surgeon. Breast Augmentation provides women with the opportunity to transform their bodies like never before. Increasing the size, volume and shape will lead to a whole new you. The procedure uses implants in order to achieve or restore your breast to their desired look. During the consultation we will discuss your goals and how to reach them. Choosing a surgeon with years of experience and knowledge like Dr. Hollingsworth can get you started on your journey to the look that you have always wanted. Achieve your dream body, call our office in Texarkana, TX today! Dr. Hollingsworth is not only the best Board Certified Plastic Surgeon in Tearkana, he is in my opinion the most educated in what he does. He has done so much for me and everything always turns out perfect, including removal of my tonsils. Two days after my tonsillectomy I was eating like I hadn't had surgery. I've had several surgical procedures as well as many ancillary procedures and facials performed at his office. I would never go anywhere else. Dr. Hollingsworth always make me feel so comfortable, along with his wonderful staff who always helps me anytime I need anything. They go out of their way for their patients. I even go by the office on occasion to just say HI. 5 stars to this wonderful crew!!! I've had breast augmentation and lift, tummy tuck, laser hair reduction and occasionally Botox and Juvederm with Dr. Hollingsworth. The results SUPER exceed my expectations!!! Dr. Hollingsworth and his staff make me feel so comfortable and really take the time to listen to my wants and needs. I never fell rushed. I ALWAYS feel like I am top priority during any treatment or surgery. That's very important to me, along with outstanding results!!! I cannot imagine going anywhere else. Thank you Dr. Hollingsworth and staff. In the fall of 2010 I was privileged to meet Dr. Hollingsworth and his very nice staff. I sought his professional advice about breast augmentation and what all that would entail. After meeting with him and gaining faith and trust in his knowledge and skill set, I decided to proceed with surgery. The surgery went as planned and all was well in my recovery. Before and after surgery his staff was very efficient in answering all of my questions. I am very pleased with the results of the decision I made 5 years ago and my breast are very natural in appearance. I am also happy to say that I will be able to breastfeed as my implants are located behind my breast muscle and will not affect the milk glands. 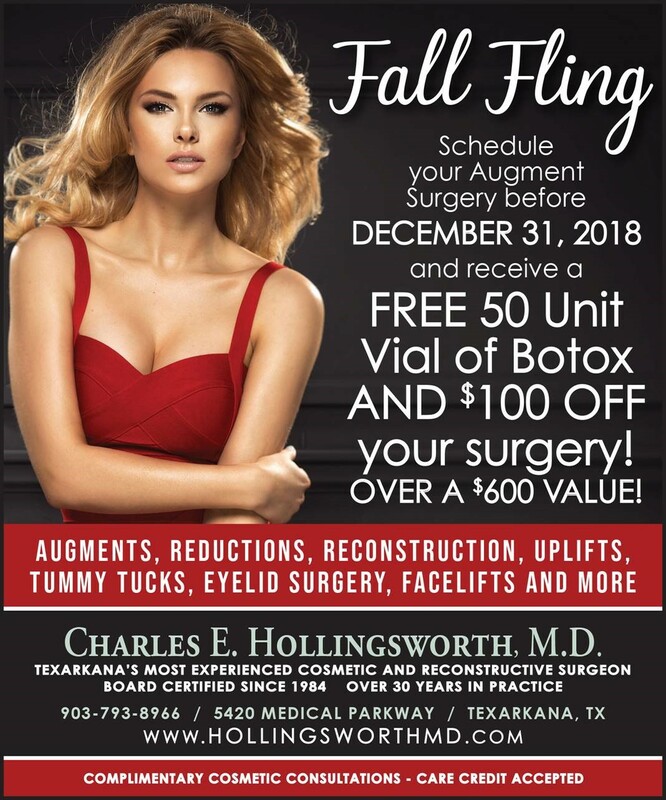 I, hands down, recommend Dr. Hollingsworth as a wonderful and experienced plastic surgeon to anyone seeking cosmetic surgery or reconstructive surgery and I still do applaud him to this day! Thank you! God Bless! After years of looking at myself in the mirror from birthing and breastfeeding two children, I was not happy with what I saw. I was very self-conscience, After my consultation with Dr. Hollingsworth it completely changed my outlook. I was so excited to have breast implants. Everyone at his office was so welcoming and helpful, from helping with sizes to looking at before and after pictures. Dr. Hollingsworth, along with his staff, was there with me through the whole process. I am so happy with the results. After all the years of being self-conscience, I can now wear a bathing suit and feel pretty. I couldn't be more happy and pleased.